How Can Major League Baseball Increase Popularity? Rob Manfred, Major League Baseballs commissioner, is doing everything in his power to try and make baseball fun again. He thinks by changing the pace of play, more people will watch baseball. He is completely wrong. Avg. MLB game 3:04 Avg. Pace of play isn’t issue in NFL..why is it in MLB? How can MLB make baseball fans happy? 1. Stop airing late night games when fans are sleeping. 8:00pm games, 9:00pm games. Keep games at the normal 7:00pm start times or have teams play at 6:00-6:30pm. Get rid of Sunday night baseball. Sunday games should start at 1:00pm and 4:00pm. The biggest fans to have and keep are children. During the months of baseball where school is still in session 1:00pm and 4:00pm Sunday games would be perfect for them to watch. 2. Lower ticket prices so families can take their children to games. This is self explanatory. 3. Lower food prices so fans can afford to spend on ballpark food. If a family brings their children to the game, you can expect them to spend money on food. Make it affordable so they come back more often. 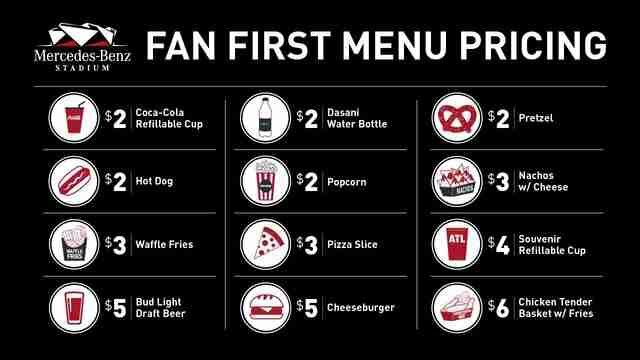 The Altanta Falcons developed a fan first menu pricing and in the first year the fans spent 16 percent more overall. 4. Market your super stars! Mike Trout, Mookie Betts, Jacob deGrom to name a few. The NFL and NBA consistently markets their well known stars on social media: Lebron, Curry, Brady, Mahomes. It would be a great idea for MLB to take a page out of the NFLs book by marketing their players with cool graphics and fun commercials. When watching football do you notice at the start of the game when they announce the players on TV they show the players height, weight and where they went to college. It would be cool for MLB to do the same on nationally broadcasted games (FOX, ESPN). Fans can learn facts about their favorite player this way. 5. Get rid of boring announcers with no passion for the sport. Fans deserve the best announcers with a ton of knowledge about the sport and teams. I have heard on so many occasions baseball announcers stay quiet during a big play. Joe Buck had one of the worst calls during the 2015 NLCS when the Mets won their first pennant since 2000. He showed very little emotion in that moment. 6. MLB stars remain unsigned weeks before spring training. This would never happen in the NFL or NBA! Most teams in those sports want to be competitive and win. If their team can afford the superstar then they will go after the superstar…. not so much in MLB. Could you imagine Curry or Lebron in this situation? It's hard to fathom that players are in camp and the top outfielder (Harper), infielder (Machado), closer (Kimbrel) and starter (Keuchel) are all unsigned. I'm sure there are no contenders that could use any of these guys. 7. Stop blacking out games in certain areas even if you pay for MLB tv! MLB wants more people to watch the sport? Then why black out games!